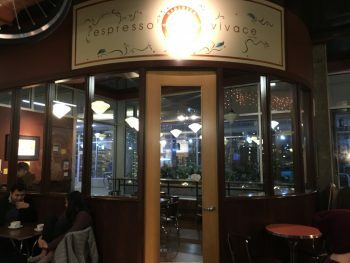 How I heard of this place: A women’s night out with friends started at MOHAI for Free First Thursday, and ended here, Espresso Vivace at Alley 24 at the recommendation of one of our local mama’s. 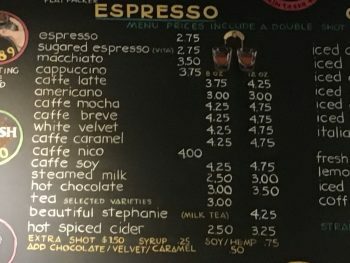 Type of cuisine: “Our charter is to research, develop, and prepare caffe espresso as a new culinary art. 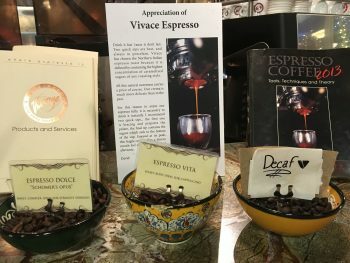 “Espresso Vivace” translates loosely as great enthusiasm and excitement for espresso, the new world coffee. 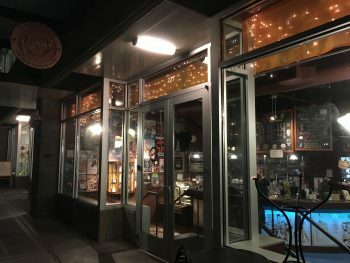 Vivace is a partnership founded by David Schomer and Geneva Sullivan in 1988. Since 1992 we have been roasting in the Northern Italian style: searching the world for the mildest arabicas and bringing each bean in our blends to the fragrant peak of caramelized sugar content. Pastries, cookies and treats on the side, sit back, enjoy a creamy, caramelly beverage and a pastry and soak it all in. 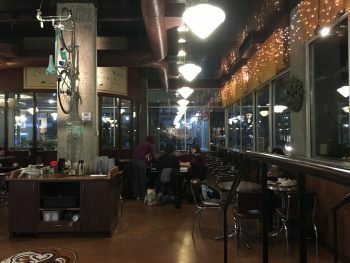 Ambiance: A dim-lit, ambient space welcomes patrons to this view of the bar. 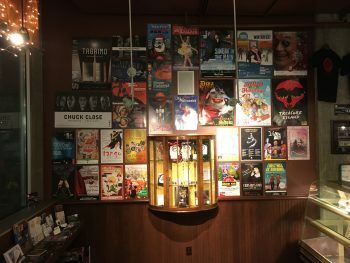 Posters of upcoming events are tastefully arranged on the entry wall, giving information while maintaining an air of creative elegance. and even a living room space complete with coffee table. 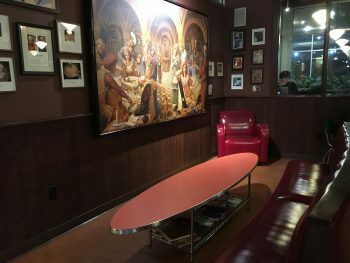 A more quite, semi-private, window-laden study room can be found in the northwest corner for those wishing to enjoy a moment of calm, away from the chatter of neighboring patrons. 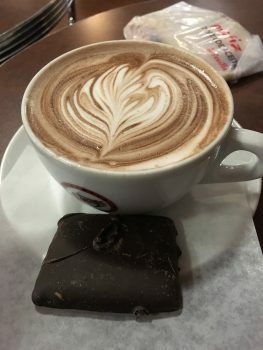 being late in the evening, I chose a 12-ounceHot Chocolate ($3.50) made with dairy-free dark chocolate, and a Dark Chocolate Graham Cracker ($1.50) on the side. 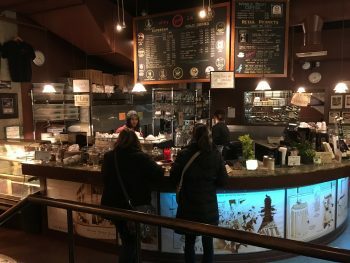 What I loved: I’ve never had anything bad at Vivace, whether it be at it’s flagship location in Capitol Hill and now this newer space in Alley 24, the espresso is expertly roasted and poured, the chocolate dark and dreamy, the pastries offering a simple and masterful accompaniment to any beverage. 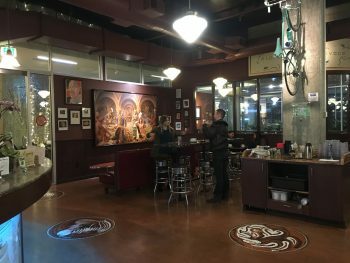 Why I loved it: Cozy and intimate seating in an open space, expertly prepared beverages and treats, friendly, helpful baristas and a location (at least in the evenings) easily accessible with plenty of seating. Yummers! Can't wait to try it!!!! My hubby did that mural! cool! © 2017 Mojdeh Sami. All rights reserved. Theme by Solostream.